Irish Oaks is a non-denominational Christian church founded by a group of friends in rural Lapeer County. These friends were interested in developing their relationship with God but felt out of place in traditional, formal churches. So they decided to form their own church with a more casual, laidback atmosphere. After forming, Irish Oaks’ members met at private locations in Lapeer Township before they ultimately decided to expand to a larger facility that had room for growth. Irish Oaks’ founder owns an agricultural property in the Township that was perfect for Irish Oaks’ intended use. 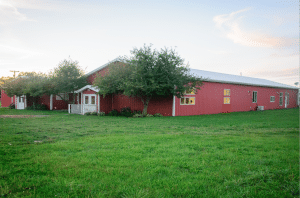 The property contains a structure (pictured above) that looks like a barn from the outside but the interior was completely renovated by a prior owner for use as a dance/theater performance venue. The property is zoned AE, Agricultural-Estate under the Township’s Zoning Ordinance. In fact, the majority of all land in the Township—around 75%–is zoned AE. “Houses of Worship” are not permitted as of right in any of the Township’s 13 zoning districts. In the AE zone, Houses of Worship are only allowed if they first obtain Special Land Use approval from the Township. To qualify as a Special Land Use, the proposed use must comply with 8 special use standards. Even more egregiously, the Township singled out Houses of Worship specifically in the AE zone and required them to comply with 4 additional use standards that did not apply to any other uses. On the other hand, a similar secular assembly use—”Township Buildings and Uses”—can operate as of right in the AE zone. In other words, Township Buildings and Uses are subject to none of the 12 use restrictions that apply to Houses of Worship. In fact, the Township’s municipal building is located in the AE zone and did not need any special permission whatsoever to be there. In early 2016, Irish Oaks applied for Special Land Use approval with the Township to use the building as a church facility. However, in June 2016, the Township outright denied the request. This barred Irish Oaks from using the building as a church. The Township denied the zoning request, in part, concluding that Irish Oaks Community Church was not “really” a Church. In February 2017, Irish Oaks filed a federal lawsuit against the Township in the Eastern District of Michigan. The lawsuit alleged the Zoning Ordinance’s differential treatment of religious assemblies facially violated RLUIPA’s Equal Terms and Unreasonable Limitations provisions. Irish Oaks further argued the fact it was barred from using the property for religious assembly but the Township could operate a secular assembly—its municipal offices—as of right in the same zoning district also violated RLUIPA’s Equal Terms Clause. During the litigation, the Township repeatedly claimed that Irish Oaks was “not really a Church.” The Township’s justification for this argument was essentially that Irish Oaks could not be a valid Church because it did not have a physical location or pastor. Irish Oaks could easily counter these points. It did not have a physical location because the Township refused to let it use the Property for religious assembly. And it was unable to bring aboard a pastor until it had a physical location. Essentially, all of the Township’s reasons why Irish Oaks was not a valid Church could be directly attributed to the Township’s own actions and ordinances. After successfully opposing a summary judgment motion, the parties met and were able to to favorably resolve all outstanding issues in this case. Under the settlement, the Township agreed to allow Irish Oaks to use the renovated barn structure as a Church. The Township also agreed not to impose time restrictions on when Irish Oaks may use the facility, to allow Irish Oaks to host a variety of outdoor events, and to pay Irish Oaks a lump sum amount to cover its attorney fees and damages. We are pleased to have been able to bring this matter to a peaceful resolution, and are thrilled for Irish Oaks, its members and their new spiritual home. If you are facing a similar religious land use issue, please reach out to one of the attorneys at Dalton & Tomich, PLC. We’d be happy to discuss your matter and see how we can help.